A senior Pentagon official said the U.S. Air Force’s new B-21 Bomber aircraft is ready to make its first flight after completing all developmental checkpoints, Military.com reported Wednesday. Lt. Gen. Arnold Bunch, Air Force military deputy to the Office of the Assistant Secretary for Acquisition at the Pentagon, announced the progress during a meeting with a Senate Armed Services subcommittee. The Nuclear Weapons Council authorized development for the National Nuclear Security Administration's (NNSA) effort to extend the W80-4 warhead's service life. NNSA, a unit of the Department of Energy, will work with the Department of Defense to develop and determine the final sustained design for the warhead via testing and analyses, the department said Thursday. 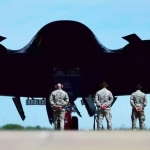 Air Force Secretary Heather Wilson announced that the service completed the developmental review for its B-21 Long Range Strike Bomber program, Military.com reported Monday. Gen. Stephen ‘Seve’ Wilson, Air Force vice chief of staff, told National Defense in an interview published Monday that the service has initiated efforts to accelerate the acquisition process in order to expedite the delivery of capabilities to warfighters. He noted that Will Roper, assistant secretary of the Air Force for acquisition, technology and logistics, came up with an idea to have the service sign 50 contracts in 50 hours in a move to speed up the procurement process. The U.S. Air Force has chosen two USAF bases to provide support services for the B-21 Raider long-range strike bomber ahead of its delivery in the mid-2020s, the service branch said Friday. Tinker AFB in Oklahoma will perform maintenance and sustainment work at the Air Logistics Complex within the base's Air Force Sustainment Center. Meanwhile, Edwards AFB will host the Combined Test Force’s testing and evaluation operations at the California base's Air Force Test Center.